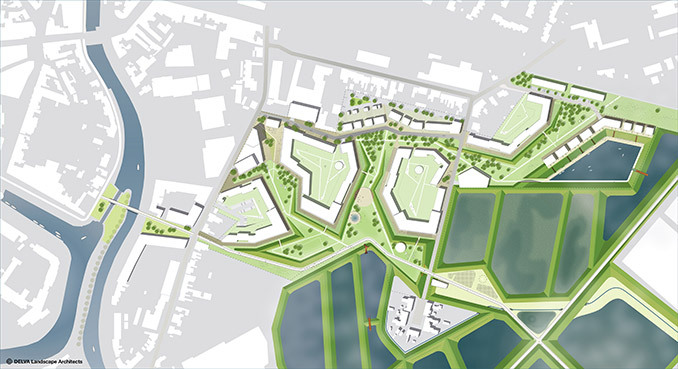 DELVA Landscape Architects, together with a multidisciplinary team lead by ION, presents the dynamic masterplan for the redevelopment of the Sugar Factory site in Veurne, Belgium. 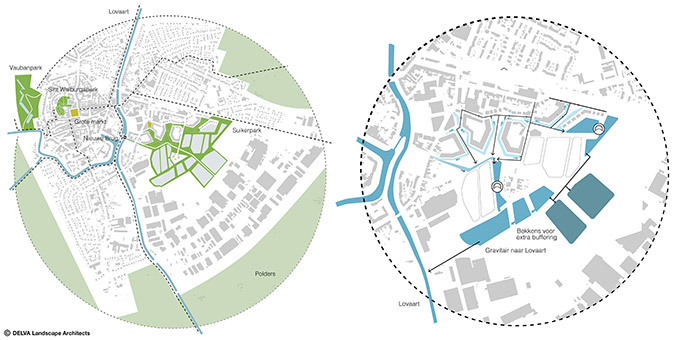 The name for the large scale redevelopment plan will be ‘Sugar Park’; A name that refers to the transformation of monofunctional industry that the site had until 2005, to a multifunctional site with living, working, small businesses, green squares and a large natural park. The site will become a whole new city neighborhood between the historical city and the dikes around the many water bodies. It is a place where living and working come together in a green oasis. The Sugar Park offers possibilities for families and companies, young and old. The future of the city lays in innovative building concepts that offer productive spaces. 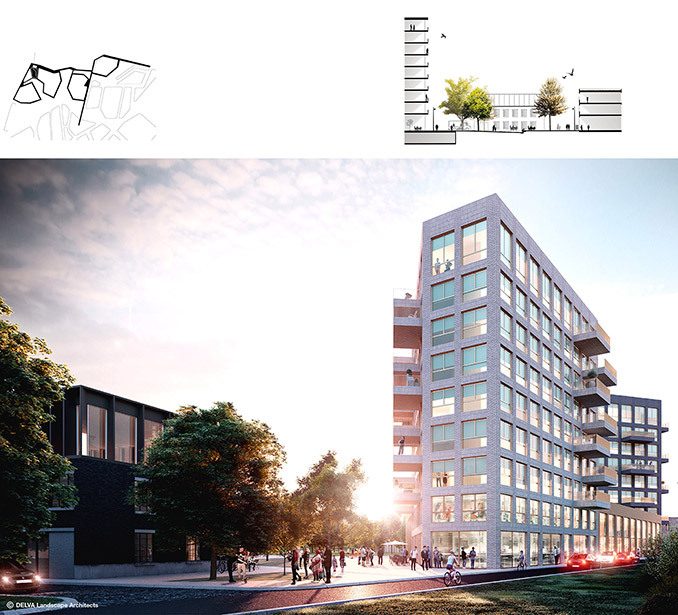 The heart of the new site will be the Sugar Square: an inspiring meeting place including, amongst other things, an incubator for start-ups, cafes, unexpected ateliers and small businesses, complementary to the inner city of Veurne. This way, Sugar Park aims to become a magnet for start-ups, by facilitating coaching and financial support to young innovative companies. The following companies or institutes have already committed to the plan: University of Ghent, Vives, VTI Veurne, Syntra West, Duco, Meli, Furnibo, Havenzate/De Lovie en Cambio. The Sugar Park builds bridges. Between housing and landscape, between families and generations, between community groups and companies. But also between the city, the site and the harbor of Veurne: the new biking bridge crossing the Lovaart and a green axis for slow traffic contribute to making the city center more accessible then ever. The connections will be developed with the utmost respect for the industrial heritage, the unique configuration of dikes and the local natural values. The Sugar Park, formed by its dikes, consists of a lot of open spaces and spaces to sit and rest, to see and be seen and off course to meet people. 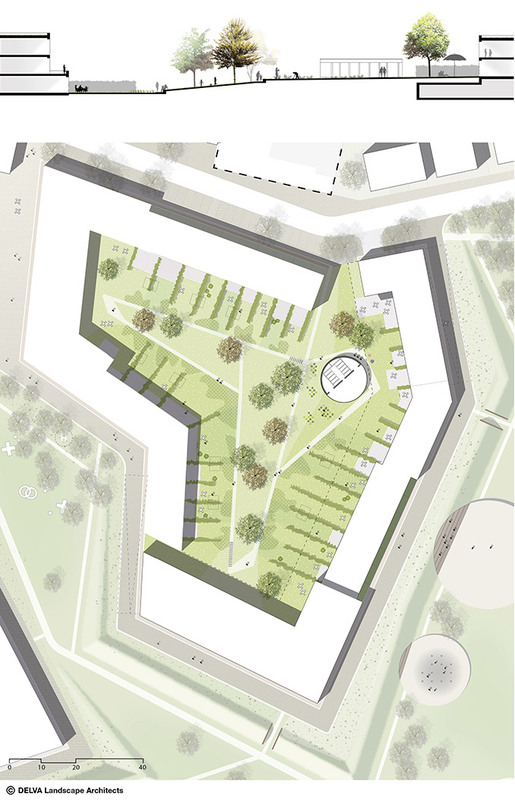 With the design, Veurne gains both a landscape park and a city square. A space for the new resident but also for the people of the surrounding neighbourhood for their daily or weekly walk, where kids can play near the water element, where you can enjoy the different seasons, sport, organize a birthday party of simply read a book. A place where you can feel comfortable on your own but also could host a bunch of people. Summer 2017, the site will be activated through a series of temporary programming, like a petting zoo. Start of realization is planned for the fall of 2018. The nature area got its shape and quality from the industrial remains of the Sugar Site. The dikes surrounding the many deposit pits form a set of playful lines through the landscape. These lines flow through into the new Sugar Park. The new dikes are not only added for the smooth transition from park into nature area, they are also a way to create a diversity of pleasant places to stay throughout the Sugar Park. The new dikes are styled from the inside and create a lush green view on the outside. Living in the Sugar Site, means sustainable living in extremis. 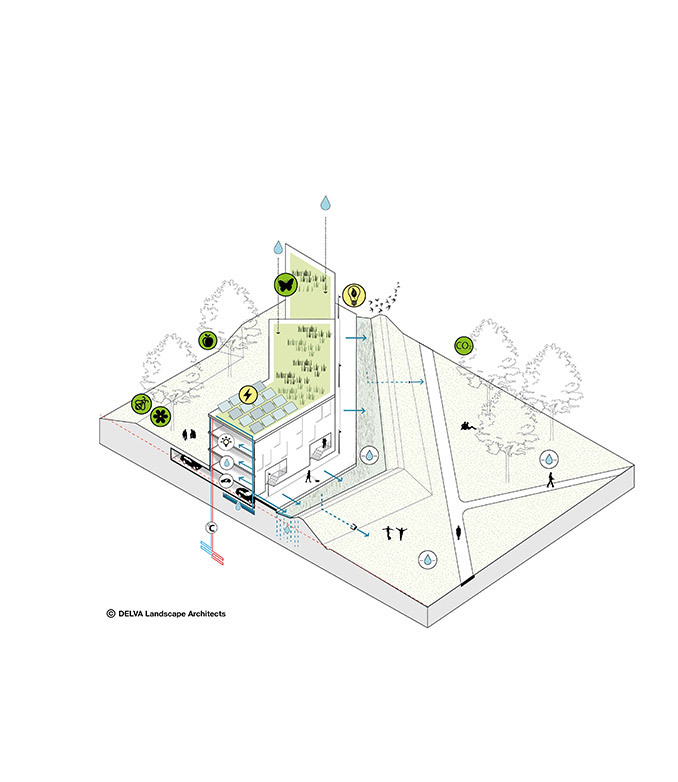 In the urban design, reuse, smart design and technique are used to underline the sustainable way of living. The site is suitable for a sustainable, organic development for many different reasons. 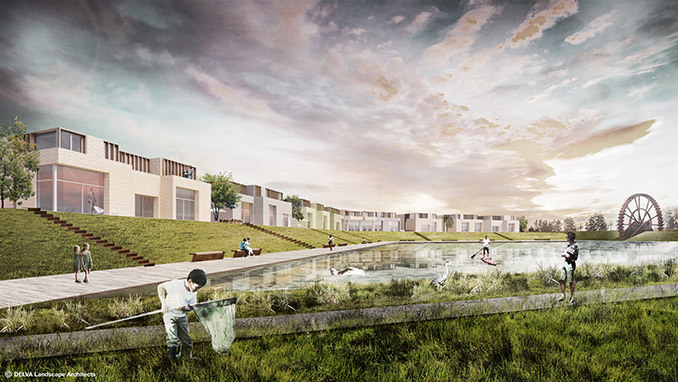 The plan offers flexibility, looks for a sustainable balance in use of water, material, energy and food and answers to the demands of future residents and the surrounding city. The concept is flexible to the initiatives that arise during the first phases of the project. An EPC of zero is easily reached by placing PV-panells and working with heat storage. Green roofs ensure less loss of heat. In addition, green rofs help buffer and slowly discharge rainwater. This water can be stored in the housing for reuse. A surplus of water infiltrated between the housing and the dike. This contributes to a good ground water level. Water forms a clear part of the site’s DNA. No rainwater should form a strain on the sewage and should have a positive effect on the decreasing ground water levels. During mayor rainfall, the water is collected in the infiltration zone. This zone forms the edge between the park and the housing. When there is a surplus of rain, the infiltration zones act as an open canal system that leads the water to the drains. Also, a water wheel gets into motion to pump the water from one basin to the other and finally to the Lovaart. The plan reduces and slows down the drainage of water and easily adds to the regional water system. It contributes to the decreasing of water problems on regional scale. This is a shared value of the team and something we want to contribute to with this plan. A first sight, the site is full of trees and lush green. At a second look, the site beams with a mysterious past. The many deposit pits are the result of a productive landscape. The water basins are now buffers, linked to ecological restoration. By positioning the two main water wheels that regulate the water levels, we create beacons in the landscape. The fluctuation of water levels will contribute to the ecological value of the deposit pits. We keep the large concrete slab as active square within the landscape park, the foundation of the silo is now the base for a park pavilion and viewing tower. All these things form a powerful family of elements. They are finished with reoccurring details and materials. The family of elements for the basis for all other elements in the park and landscape. We use the rough, low-maintenance corten steel as a base for the elements. The corten steel bird watching sport is placed over the dike and looks over the large water basin. The bird watching hut, benches, lighting, corner pieces and dike passages are made with the same material and same detailing. The park and landscape are connected through these reoccurring elements. A landscape that is not spatially limited by a fence but with recognizable materials that tell the industrial past in a new and functional way. The four atmospheres create complexity and a layered public space, making this area so tempting. The contrast between the courtyards and the large scale outside, the intimate spaces of the four park chambers and looking from a bird watching spot over the water. The pleasant urban square versus the green fields. All these contrasts create tension and surprises throughout the area and by doing so give it the so well fitting and unique identity. 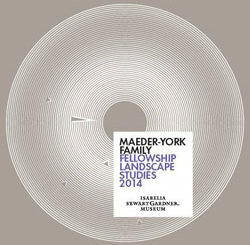 Following, the four atmospheres are detailed in Dikes, Sugar Park, Courtyards and Sugar Square. 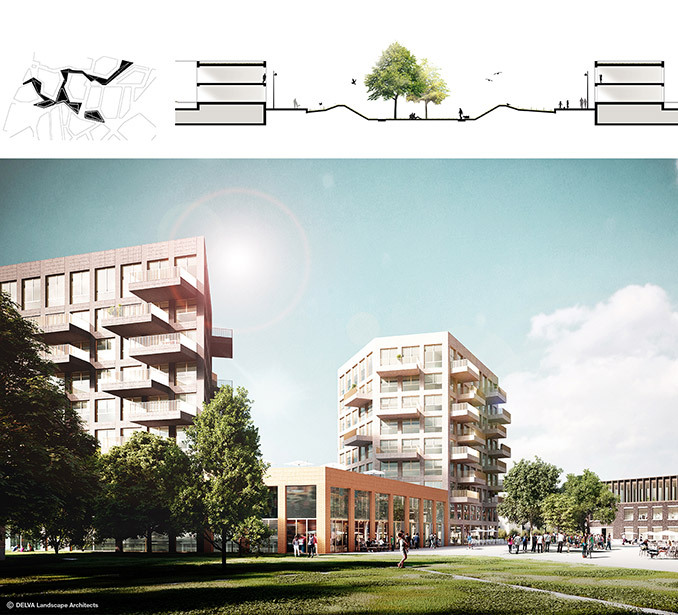 The system of dikes opens up towards the housing blocks and creates an unexpected play of lines between city and landscape. The spatial identity of the park is based in the nature park of the deposit pits. Dikes form the border between nature and culture. The park is shaped with natural materials, contributes to a sustainable water system and ecological values, facilitating sport and play. By the conscious placement of the dikes, the possibility arises to make underground parking without going very deep under ground level. The result is a lush courtyard. A place with deep private gardens with a smooth transition into collective green space. 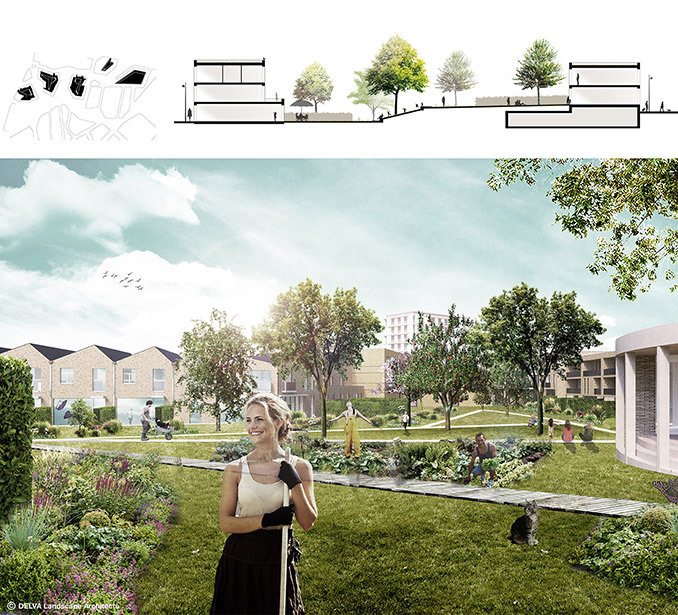 The space functions as a meeting place for neighbours to meet and work together in the collective garden. The Sugar Square, marked by the Sugar Tower and the former entrance building of the Sugar Factory. An interesting meeting between old and new. Together they form inspiring walls of the mineral square that continues on one side towards the Sugar Park. A multifunctional square that can host many activities in itself and offers a great addition to the series of squares in Veurne.